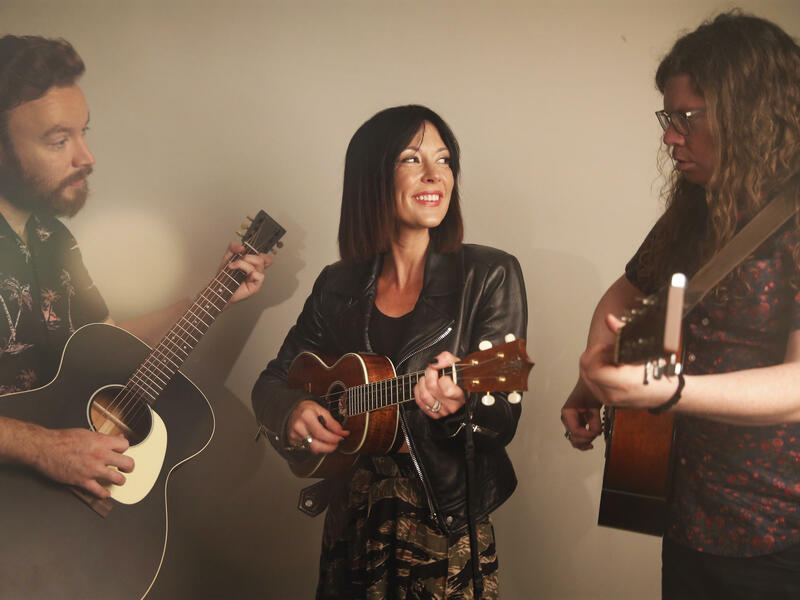 "The beauty of songs, I think, is if you do it right a lot of people can relate to it in their own way," Amanda Shires says. Amanda Shires (center) with bandmates Seth Plemmons (left) and Zack Levine (right). Amanda Shires is known for her folksy, Americana sound. In 2017, Shires was named the Americana Music Association's Emerging Artist of the Year and she frequently lends her voice and style to her husband Jason Isbell's band, The 400 Unit. But her new solo record, To the Sunset, moves away from her normal style, taking on more pop sounds with crunched guitars and layered vocals. Shires came to NPR in Washington, D.C. to perform songs from the new album and talk to NPR's Don Gonyea about the stories behind them, as well as about being a woman in country music and new motherhood. Don Gonyea: I've seen you quoted as saying that women in country music, and even in Americana music, are expected to sound a certain way. Maybe sad, wistful songs. You walked down the Country Music Association red carpet in 2017 wearing a T-shirt that read, "Mama wants to change that Nashville sound." Is the musical style on this album your way of trying to make that change and defy those expectations? Amanda Shires: No, only because I don't play Top 40, but I feel like when you notice things that are kind of unfair or lopsided, I think you still got to talk about it, though, being in the music business, about other music genres and stuff. But now, mostly in Top 40, still even with all the talk about it, you still turn on the radio, and you still listen to it for two hours, and you only hear two women or three if there's a trio that happens to have a woman in it. And then when you do look at the charts and there's maybe one woman on it — I'm talking about Top 40 country — it'll be like a slow, sad, needy woman song. And it's real frustrating I think. And you know what else happens with that? As a result, when you do festivals and stuff, they don't pick the women because they have to have upbeat songs. So it's a weird Catch-22, I mean, from where I'm standing. One song that really sticks in my head especially the guitar and your vocals, it's one that really seems to embody this very progressive sound that you've got in this record is called "Eve's Daughter." First thought: That has to be a blast to sing live with a band on stage. It is, it's a lot of fun. I double-dog dare them to play that on the radio. Right now. I suspect public radio stations are playing it. So it's called "Eve's Daughter." Tell us who Eve is and who is her daughter. The idea started with my mom because it's really her story and then it's also a blend of my own perspective if I were to be her, in a way. I guess it starts where I come into the picture. So my dad whisks her away to Mineral Wells, Tx. — a beautiful place — and it doesn't work out, and she's moving around and getting lots of jobs doing things like being a fishmonger and a bail bonds lady and going to school. And then also, accepting the choices she's made and then being cheerful about it. So you have a daughter now. Has that experience made you think differently about your own relationship with your mother? Do you understand more? It's a trip. You know when you have a child and then as you get older, your parents start becoming more like your friends and then telling you things they wouldn't have told you when you were 14 or 15, answering questions about the past or whatever. And when my daughter was born, we talk about a lot of stuff because motherhood is a guilt-ridden situation. I go all around, and I leave her, so I talk about it all the time with her. She was telling me about her own mother abandoning her, like for good, so I wasn't doing a bad thing, really, just going working and making it OK for her to want to make those choices if she gets older to be able to do what she wants to do and feel OK with it. And children reveal things to us about ourselves in pretty powerful ways. They do. And they even point out things like light sockets or electrical sockets. The other day [my daughter] was sitting at the breakfast table and I was sitting there with her and she was like, "Get up!" I thought something was wrong, like I don't know what it could have been. But then she said, "You're sitting on me shadow." That's pretty cool. That's a good line. I'll keep it. She's going to need co-songwriting credit. You've got one last song you're going to take us out with. This is that song called "Charms" about mothering and mothering back and about our place as humans in the world. Charms as in a charm bracelet? Charms can really be anything, but I did refer to a bracelet in the song. I don't want to give away all the secrets is what I'm trying to tell you. Because the beauty of songs, I think, is if you do it right a lot of people can relate to it in their own way and make their own meaning out of things. And so, I don't want to give away the secrets and ruin somebody's idea of what the song is to them. Today, some music from Amanda Shires, a talented songwriter in the Americana music world. She has released albums on her own and has won acclaim as a member of the 400 Unit, the band that backs up her husband, songwriter Jason Isbell. Now, Amanda Shires is out with her fifth solo album. It's called "To The Sunset." Earlier this week, she stopped by our Washington, D.C., studio to perform a couple of songs. She started with one titled "Break Out The Champagne." AMANDA SHIRES: (Singing) Talking between bathroom stalls, Kelly said the world would end tonight, that we'd be ashes in apocalyptic light. And I said, break out the champagne if we won't be seeing tomorrow. Let's get on with the show, on with the show. Somewhere above the Newfoundland Sea, pilot said we'd lost an engine. In a split second, I made an executive decision. We're going to break out the champagne. Everybody look out below. Let's get on with the show, on with the show. Adios. The morning love told her he was leaving, he said they'd be better as friends. It's no one's fault. The heart wants what it wants. And then she thought, I'm rock and roll, and you're golf. Break out the champagne, I've been thinking the same thing myself. We might as well break out the champagne if that's really how it's going to go. Let's get on with the show, on with the show. Adios. GONYEA: That's a great song. Tell me who you're playing with here. Introduce your bandmates. SHIRES: Ok. Playing the guitar from outside of Houston, Texas, Seth Plemmons. And then playing the other guitar, from Miami, Fla., Zach Setchfield. GONYEA: It sounds great. So you've been known for kind of a folksy Americana sound, not unlike what we just heard with that song. But on this album, boy - the guitars crunch, the vocals are layered. There are some more pop-sounding tracks. And one song that really sticks in my head is called "Eve's Daughter." Let's play a little bit off the album. To give you a break from singing for a minute, here's the track "Eve's Daughter." SHIRES: (Singing) I was young, spring had sprung. I wanted out of (unintelligible). Kept the party dress in the glove compartment of my green and white Ford Bronco. A gust of wind came blasting in the gas station where I was working. He was 23, he was on leave, and the rest gets a little blurry. Maybe it was circumstance, but I saw my chance, and I took it. Through the sunset, shifting gears till there's something better shining diamond clear, shining diamond clear. GONYEA: So it's called "Eve's Daughter." Tell us who Eve is. And who is her daughter? SHIRES: The idea started with my mom because it's really her story. So my dad whisks her away to Mineral Wells, Texas - beautiful place - and then it doesn't work out, and she's moving around and getting lots of jobs and going to school and also accepting the choices that she's made and then being cheerful about it. SHIRES: When my daughter was born - we'd talk about a lot of stuff because motherhood is a guilt-ridden situation. I mean, I go all around, and I leave her, so I talk about it all the time with her. And she was telling me about her own mother abandoning her for good, so that - I wasn't doing a bad thing, really. I'm just going working, making it OK for her to want to make those choices if she gets older to be able to do what she wants to do and feel OK with it. GONYEA: Yeah. And children reveal things to us about ourselves in pretty powerful ways. SHIRES: They do. The other day, she was sitting at the breakfast table when I was sitting down with her. And she was, like, get up. I thought something was wrong. But then she said, you're sitting on my shadow. That's a good line. I'll keep it. GONYEA: She's going to need co-songwriting credit. SHIRES: (Laughter) Don't tell her that. I gave her a popsicle. GONYEA: Amanda Shires is with us in the studio. Her latest album is called "To The Sunset." Thank you so much for coming in to play for us. And you've got one last song that you're going to take us out with. GONYEA: And tell us what it is. SHIRES: This is that song called "Charms" about mothering and about our place as humans in the world. (Tuning ukulele). I don't want to give away all the secrets is what I'm trying to tell you. SHIRES: Because what's - the beauty of songs, I think, is, if you do it right, a lot of people can relate to it in their own way and make their own meaning out of things. And so I don't want to give away the secrets and ruin somebody's idea of what the song is to them. GONYEA: Exactly. And you have switched to your ukulele here. SHIRES: Yep. I call her the ugly lady. (Singing, playing ukulele) My mom gave me her gold charm bracelet when she left me on my own. Can't remember what the charms were or the color of the stone. And I still hate your father for selling what was never his to pawn. Maybe being human is an orphan condition, and what's missing isn't what should be found. Maybe moving forward is my only ambition, and I never let myself turn around. I'm daring... Transcript provided by NPR, Copyright NPR.